Ravello has been a destination for movie stars, and is one of our favorite getaways on the Amalfi Coast. We’ve visited multiple times and continue to return. Many people visit for the day, but we recommend staying for a few days. Relax at the spa, wander the streets of downtown Ravello, take a cooking class, and enjoy the fragrant gardens. 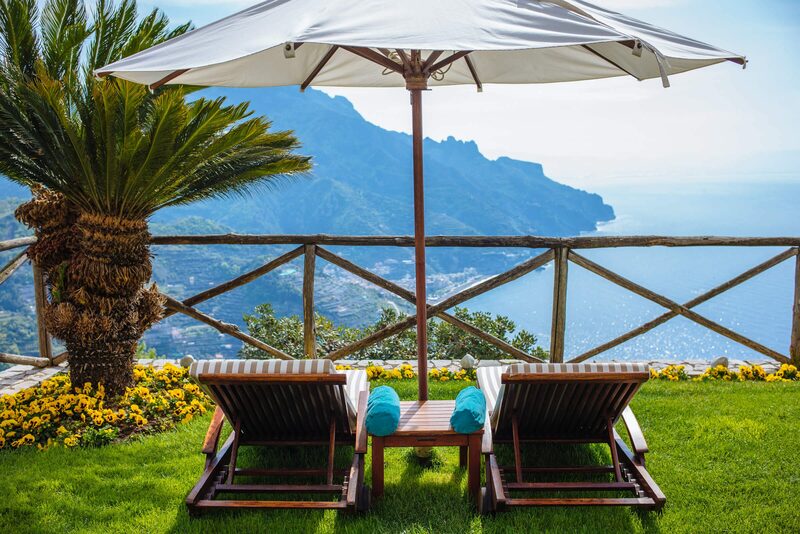 Where to stay in Ravello. 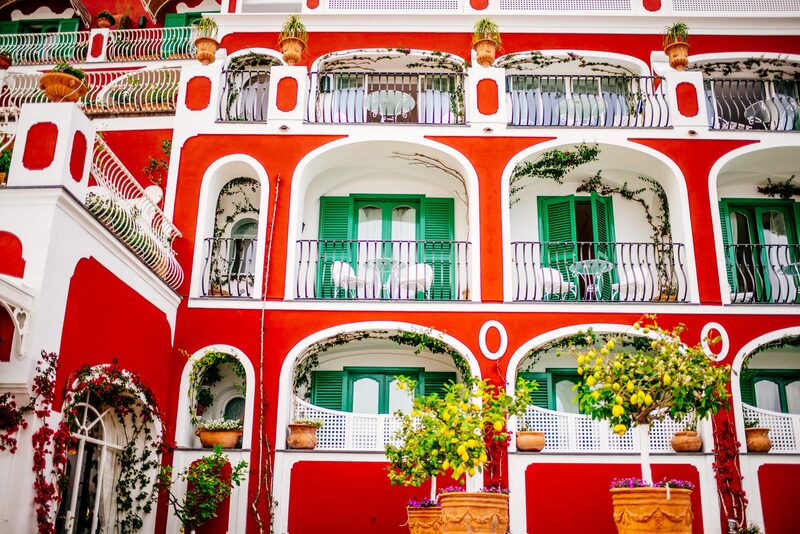 We recommend staying at our favorite hotel, Palazzo Avino. It’s a fantastic spot, close to downtown, with a view that is out of this world. You may love it so much you won’t want to leave. Relax by the pool and take in the view, or take their shuttle down to the beach club for dip in the Mediterranean. Where to eat in Ravello. For a sophisticated dinner, visit Palazzo Avino’s one Michelin star restaurant Rossellinis. Their creative approach to Italian cuisine won’t disappoint. For a a simple rustic lunch, stop into Cumpa’ Cosimo. You’ll find typical southern Italian dishes in a relaxed environment. Keep an eye out for owner Netta Bottone. You’ll know her by the red flower in her hair. Plan to spend a day at Mamma Agata’s. You’ll learn how to cook, but you’ll also leave too full for dinner. Visit the Lobster and Martini bar at Palazzo Avino for a cocktail, lunch, or dinner. This is by far our favorite place for martinis in the Amalfi Coast. They have a list of over 100 different martinis, as well as a new list of Moscow Mules and tequila martinis. What to do in Ravello. 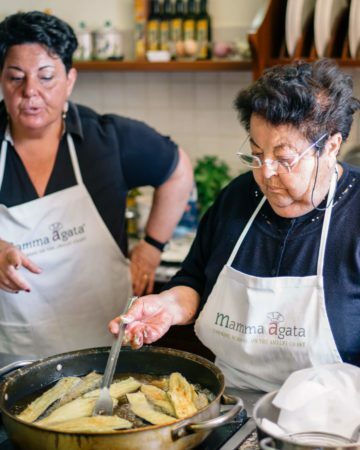 Take a cooking class at Mamma Agata’s Cooking School. You’ll learn how to make all kinds of dishes from appetizers and simple pasta sauce to her famous eggplant parmesan and lemon chicken. Check out the charming downtown area of Ravello, including little art shops and custom sandal stores. Schedule a boat ride or rent kayaks. It’s just a short drive down to the water. Visit the gardens of Villa Rufolo and Villa Cimbrone. Walk down paths filled with flowers in the garden of Villa Cimbrone to the Infinity Terrace where you’ll have a fantastic view. If you don’t like heights, you may want to skip this one. Are you a music lover? Schedule your trip during Ravello’s famous music festival. For ceramics, visit Pascal Ceramics. Every ceramic shop claims to be the best, but we found Pascal’s to have the most gorgeous designs and intricate shapes. If you’re looking to visit a winery, try Marisa Cuomo. You’ll have to book a car, but the wines are fantastic. If you can’t make it to the winery, you’ll probably find it on most menus since it’s very local.